rec. 13, 25 April 2011, 92nd Street Y, New York City. 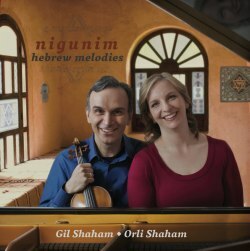 One of the most memorable concerts I have heard in the last couple of years was Gil and Orli Shaham’s programme Nigunim in New York’s 92Y, in April 2011. I have been hoping ever since that this event would be put on disc, and here it is. Not all the concert is here. For example, I am pretty sure that some George Perlman pieces, such as the charming Dance of the Rebbitzen, were played there but they did not make it to the disc. Even so, most of the programme is preserved. Three large works are surrounded by smaller pieces written by Jewish composers at the beginning of the 20th century. This was the time when this nation’s musical culture was trying to find its way and join the family of other national traditions. The smaller pieces all belong to the traditional styles of Jewish songs and dances, the styles that are associated the most with the “Classical Jewish” music - think Ernest Bloch. Joseph Bonime’s Dance hébraïque opens proceedings and already displays that prominent quality of the Jewish music so admired by Shostakovich, its sad joy - or joyful sadness. This is laughter with sad eyes, and a frown with a wink. The music sounds as if Liszt had decided to write a Hebrew Rhapsody: a stately dance with more playful episodes. The Hebrew Melody by Joseph Achron is a dramatic ballad; it tells a story of unhappy events. The same composer’s Hebrew Lullaby is bittersweet and tense, while the attractive Hebrew Dance alternates scenes of different character, tempo and emotion, like a mini-rhapsody. Leo Zeitlin’s Eli Zion has the feeling of a cantor singing in a spacious synagogue, a deeply felt, fervent declamation. Such music could only come from a culture where prayers are sung, as it is both a song and a prayer. Between these traditional works, the monumental Violin Sonata No. 3 by Avner Dorman looms like an iceberg. It is very different from the other works; and yet the roots are unmistakably the same. Dorman looked outside the standard box and brought in musical influences from such different places as Northern Africa, the Balkans, the Caucasus and Central Asia. His intent was to imagine the hypothetical music of the Ten Lost Tribes. The work is entitled Nigunim; this Hebrew word is the plural of nigun, which is an instrumental tune of improvisatory character. The music emerges from the mists, evoking remote times. The Adagio religioso has bold, affected gestures, and a sensation of spiritual mystery, rather like Arvo Pärt’s Fratres. The active, dynamic Scherzo has folk dance traits, but the insertion of hostile episodes stops this dance from becoming a happy affair. The slow movement is meditative, with the static beauty of Feldman and Pärt. Dorman knows how to bring out the beauty of a single note, transition, even a pause. Memories of notes hang spectrally in the air, like memories of people and places. When the melody appears, it is simple and devoid of caramel. The music has something of Shostakovich’s fragile angularity and rises to an intense climax. Then we plunge into the dancing abandon of the finale, a saltarello-like tour de force, a swirling dance frenzy. The writing for both instruments is very inventive. Each turn of the road brings something unexpected. Dorman writes a lot for the piano, and so the piano here is an equal partner. It’s certainly not an accompanying role. The violin sings in all kinds of voices, from the cello to the fiddle and up to the stratosphere. Though stylistically the only modern work here, Nigunim looks natural among the more traditional pieces, like a distant cousin that is welcome at the family feast table. This work startles and enthralls. Three pieces from the Schindler’s List soundtrack by John Williams share the general nostalgic atmosphere. The melody of the first, the main theme of the movie, resembles one of the Harry Potter tunes, and is very sweet, but also touching and sincere, full of sad beauty. The waves of memory carry us to the Krakow Ghetto in winter. This angular, bitter music brings gruesome thoughts. The violin is not an impartial storyteller. The mini-cycle is closed by Remembrances, with another haunting melody. There is no smile behind this sadness, yet there is a feeling of calmness and acceptance when looking back. Bloch’s Baal Shem is again in the traditional “Classical Jewish” style. The suite has three parts. Vidui is a plaintive narrative, spacious and bitter. Nigun is more expressive and passionate, heating up to an operatic level. Simhat Torah is one of the merriest days in the Jewish calendar, and the final movement speaks of untamed rejoicing, with episodes of happy dance interleaved with stretches of aquiline ecstasy - a radiant, positive ending to the album. I can’t imagine a better performance of these works. There is no need to recount Gil Shaham’s devilish virtuosity. He plays with panache; however, it’s the expressivity that is the center-piece here: Shaham is totally absorbed, and his hands seem to be directly connected to the soul. Orli Shaham’s piano wraps and balances the violin gently, giving it caring support. In the rare moments when the piano takes the stage, it shows power and finesse. As expected this sibling duo is in perfect sync. There is no sameness in the interpretations, no “main courses” and “fillers”: each piece is made special. The recording favours the violin slightly; it is clear and spacious. The liner-note is informative and interesting. This album is full of that singular Jewish spirit, the sadness and the smile. It is heartfelt and profound.